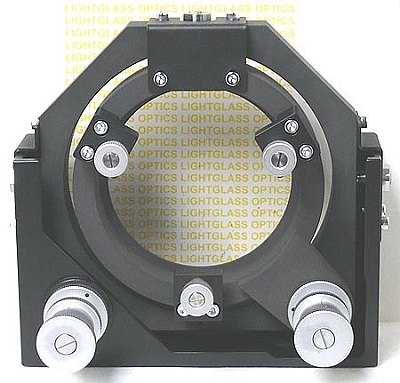 The OptoSigma 112-4440 4" Large Precision Mirror Mount holds optics up to 4 inches in diameter and is a extremely solid mount. With a range of +/- 6 degrees, and OptoSigmas coaxial fine/coarse control knobs, your optic can be positioned with a sensitivity of 2.7 arc seconds! Once set, it stays!